Wearable Bananas in the Tokyo Marathon - They Even Tweet! Some will remember bananas being part of the fruit headdress donned by Carmen Miranda circa 1940. Some 75 years later who knew we’d be rockin’ Apples on on our wrists? And now bananas?! At Sunday’s Tokyo Marathon some lucky fans and runners were presented with free Dole “Gokusen” bananas, premium bananas that weigh in at about 200 grams, about twice the heft of a regular Cavendish banana here in the U.S. Why? In celebration of the two runner sporting Dole’s wearable banana device. So how does this banana bracelet work? 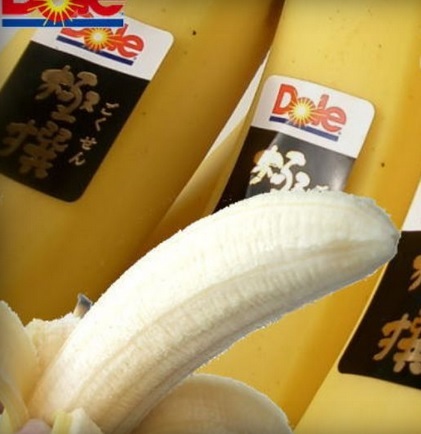 The bananas are peeled first to remove the inside and then resealed after a LED display and a smaller banana is put inside, a spokeswoman for Dole explained to Japan RealTime. Runners can check multiple data on the banana LED throughout the race. The device comes with a built-in GPS, can display time, heart rate and can even send a tweet! #sweatybanana #weigheddownbyabanana The banana is worn around the wrist like a watch and is connected by a cord to a separate device carried by the runner. Is that a Banana On Your Wrist or Are You Just Happy to See Me? To add to the bizarre spectacle Sunday, Ketchup maker Kagome debuted their wearable tomato machine as headgear for those wanting to consume the fruit while jogging. REALLY? Potassium-rich bananas, I get, but lycopene-rich tomatoes? Maybe. What a mess that roadway could become. Runners can peel the banana and eat the fruit inside AFTER finishing the marathon, making it the first edible wearable device in the world, according to Dole Japan, but we know to give Ms. Miranda a slice of the credit. Would YOU wear a banana on your wrist? Okay, how about an artichoke? Posted in featured, posts, veggie techTagged new products, silliness, technology, WorldwideBookmark the permalink.